Tyler Jeffrey Dillashaw, professionally known as TJ Dillashaw is an American mixed martial artist. He turned pro in 2010 and is currently signed with the Ultimate Fighting Championship (UFC). He is the two-time UFC Bantamweight Champion. He is ranked at No. 9 in official UFC pound-for-pound rankings as of March 2019. NYASC suspended him retroactive to 19 January 2019 until 19 January 2020. NYASC and USADA found adverse findings following his last fight against Henry Cejudo on 19 January 2019. He has over 1.4 million followers on his Instagram. Where is TJ Dillashaw from? TJ Dillashaw was born on 7 February 1986. His birth name is Tyler Jeffrey Dillashaw. He was born to a father Hal Dillashaw, and a mother, Janice Dillashaw. He belongs to White ethnicity. His birthplace is in Sonora, California in the United States. He holds American nationality. His zodiac sign is Aquarius. He grew up in Angels Camp, California. He attended Bret Harte High School. At Bret Harte, he competed on the school's wrestling team. He also played on the high school football team for his 2002-03 junior year. He graduated from high school in 2004. After high school, he enrolled for college at California State University in Fullerton. At college, he competed for the Titans wrestling program. He was a four-time sectional qualifier and two-time California Interscholastic Federation (CIF) state qualifier. He placed fifth at the CIF state championship and ended the season with a record of 45-7 as a junior. As a senior, he placed second at the CIF State championships with a 52-6 record. He completed his high school with an overall record of 170-33. He received a full-ride scholarship to wrestle for Cal State Fullerton Titans. He posted a 14-16 record including 100-8 mark in duals and 3-4 in Pac-10 in his freshman years in college. He traveled to Ukraine in the summer of 2006 to work in his wrestling skills. He posted a 17-14 record including 11-4 mark in duals and 5-3 in Pac-10 in his sophomore years. He placed sixth in the University Greco Wrestling Championships in Akron, Ohio at 132.25 pounds in 2007 and fourth at the Pac-10 championship. He finished fourth in the Pac-10 Championships. He posted a 22-10 record with four pins including 7-0 in Pac-10 duals. He was ranked 10th in the nation at 133 lbs in his senior season. He is also a 3X NCAA qualifier. He considered a career in MMA after graduating from Cal State Fullerton. Mark Munoz who coached at Cal St. Fullerton for 3 years invited Dillashaw to join the Reign Training Center fighter class after graduating from high school. Dillashaw trained with Team Reign for a year and a half. Coach Munoz encouraged Dillashaw to move to Team Alpha Male in Sacramento, California. 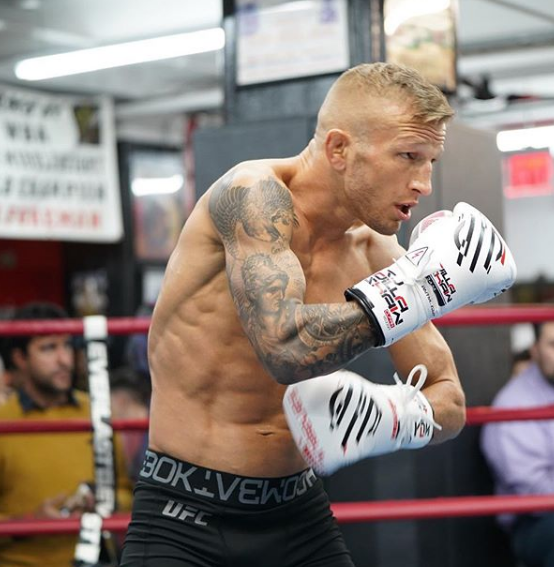 Dillashaw began training with Team Alpha Male. He collected a 2-0 amateur record. He turned pro in 2010 and made his professional debut in March 2010 against fellow pro debut, Czar Sklavos. He defeated Czar via unanimous decision. He defeated Brandon Drucker at Fight For Wrestling. It was an MMA event located in California to raise money to fund the Cal Poly wrestling team. He signed with the UFC in 2011 to compete on The Ultimate Fighter: Team Bisping vs. Team Miller. He defeated Matt Jaggers in the first round via TKO to gain entry into the Ultimate Fighter house. He was selected as a part of Team Bisping and the second bantamweight (seventh overall) chosen for the team. He defeated Dustin Pague via unanimous decision to reach the bantamweight final. He made his UFC debut in December 2011 in Las Vegas, Nevada at The Ultimate Fighter 14 Finale. Dillashaw lost to John Dodson via TKO. It was the final of the bantamweight tournament. He then defeated Vaughan Lee via submission at UFC on Fuel TV: Munoz vs. Weidman, Issei Tamura via TKO at UFC 158, and Hugo Viana via TKO at UFC on Fox 7. Previously, his fight with Raphael Assuncao in September 2013 at UFC Fight Night 28 was canceled due to a minor medical issue for Assuncao. Their bout took place in October 2013 at UFC Fight Night 29, where Dillashaw lost to Assuncao via split decision. Both the fighters earned Fight of the Night honors. He defeated Bantamweight champion and top 5 pounds for pound Renan Barao in the fifth round via TKO to become the new UFC Bantamweight champion at UFC 173 in May 2014. It became one of the biggest upsets in UFC and MMA history. He earned Fight of the Night and Performance of the Night bonuses. His immediate rematch with Baron was scheduled in August 2014 at UFC 177. Barao attempted to cut his weight. As a result, Barao had to be admitted to the hospital on the day of the weigh-ins. Joe Soto replaced Barao. Dillashaw defeated Soto via knockout in the fifth round earning his second consecutive Performance of the Night bonus. A rematch with Barao in April 2015 at UFC 186 was canceled once again when Dillashaw sustained a broken rib injury while training. The rematch between Dillashaw and Barao eventually took place at UFC on Fox 16 in July 2015, where Dillashaw defeated Barao once again via TKO in the fourth round to retain his title. He also earned a Performance of the Night bonus. He relinquished his title dropping a split decision in a bout against former champion Dominick Curz in January 2016. However, both the fighters earned Fight of the Night honors. He later won the rematch with Raphael Assuncao in July 2016 at UFC 200. UFC announced in January 2017 that he would be one of the coaches opposite Cody Garbrandt on The Ultimate Fighter 25. The pair was expected to face each other in July 2017 at UFC 213. Their expected bout was postponed after Garbrandt sustained a back injury. Their bout was rescheduled to take place in November 2017 at UFC 217. Dillashaw defeated Garbrandt via knockout in the second round and regained the UFC Bantamweight Championship. The fight also earned him his fifth Performance of the Night bonus. He once again defeated Garbrandt in the rematch in August 2018 at UFC 227. He won via TKO and earned the Performance of the Night bonus. He was initially scheduled to face Henry Cejudo on 26 January 2019 at UFC 233 for the UFC Flyweight Championship. However, their fight was moved a week earlier at UFC Fight Night 143 after that pay-per-view event was canceled. He lost the fight via TKO just 32 seconds into the first round. 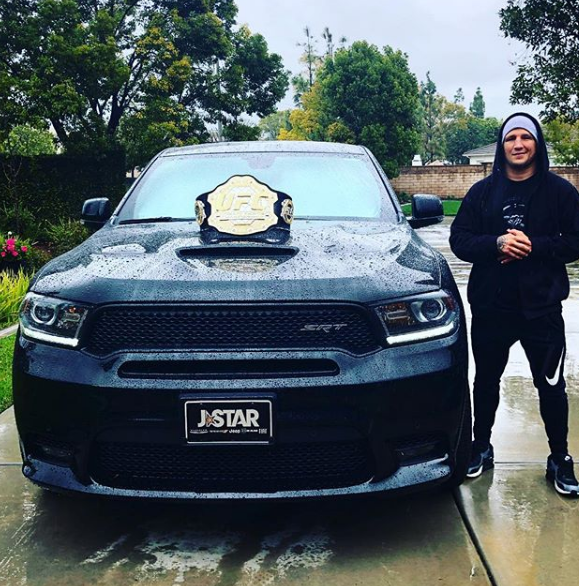 He announced via Instagram on 20 March 2019 that he would be voluntarily relinquishing the UFC bantamweight championship after USADA and NYASC found adverse findings following his last fight against Herny Cejudo. He received a one-year suspension by the NYSAC retroactive to 19 January 2019. 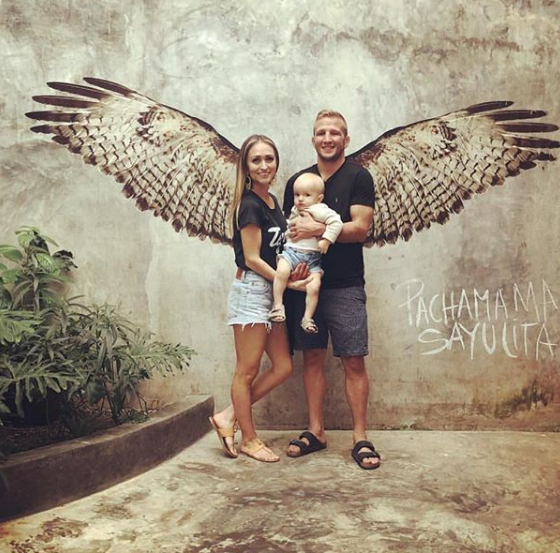 He is now ineligible to fight until 19 January 2020.
Who is TJ Dillashaw married to? TJ Dillashaw is a married man. He is married to Rebecca. The couple tied a knot to each other in June 2014. The couple has a son born in December 2017. His sexual orientation is straight. He lives with his family in Denver, Colorado. What are TJ Dillashaw's Body Measurements? 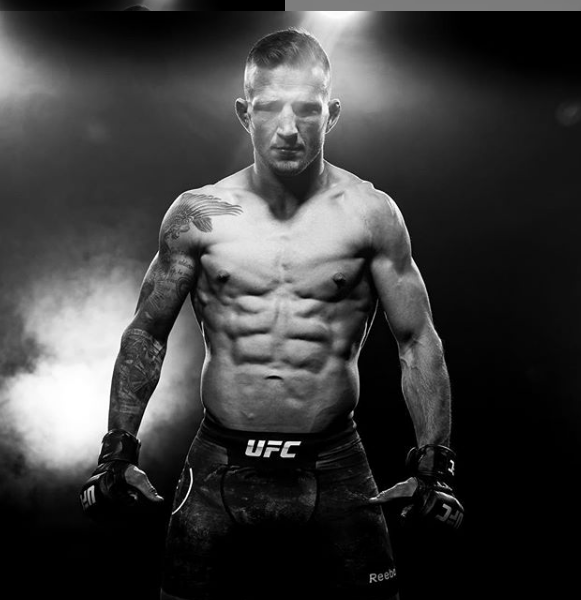 TJ Dillashaw stands at a height of 1.69 m i.e. 5 feet and 6 and a half inches tall. He has a body weight of 124.6 lbs i.e. 57 kg. He has a reach of 67 inches. He has an athletic body build. He has dark brown eyes and his hair color is blonde. 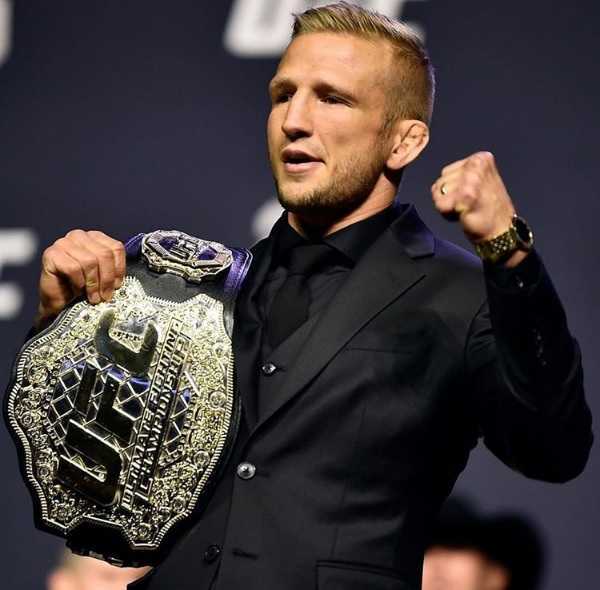 What is TJ Dillashaw's Net Worth? TJ Dillashaw earns via his fighting career. His earning comes from contracts, fights, fight honor bonuses, and endorsements. He has also appeared in TV commercial for Toyo Tires. He has endorsed Muscle Pharm, Boost Mobile, Green Roads, and Virus International via social media. As of 2019, his net worth is estimated at $1.3 million.